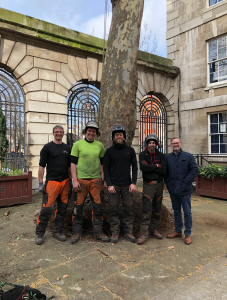 Over the last few months, lots of planning has been happening behind the scenes to implement a refurbishment of the Princess Alice Garden. 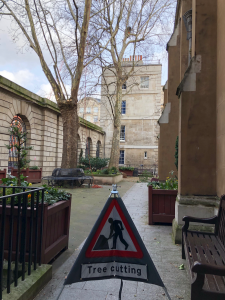 The garden, situated on the boundary of the Barts site, tucked away behind St. Barts-the-Less church, is a popular haven for patients, relatives and staff; providing a little bit of seclusion from the hustle-and-bustle of the hospital. 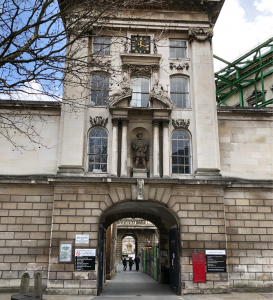 Utilising money from generous legacies, Barts Guild, who manage the garden, have committed to a refurbishment of the area. 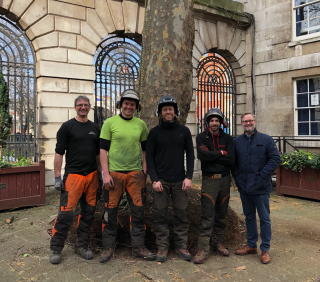 Initial works started on 9th February 2019, with tree surgeons commencing some initial taming of the trees. 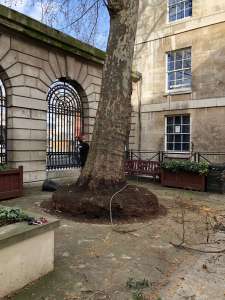 This included removing the cracked and broken walls at their base as well as trimming the branches; enough to still provide some shelter, but enabling, for example, the King Henry VIII statue to be seen more clearly than usual! More planning and works are still to come!